This volumetric air meter device measures air entrainment by the "Volumetric Method." Air is removed from a known volume of concrete by agitation in an excess of water. It may be used with any type of aggregate including light weight and porous material. 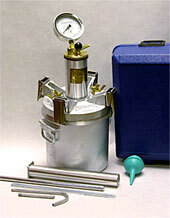 The test is not affected by atmospheric pressure and the specific gravity of the material need not be known. A direct reading sight gauge is built-in to the instrument. The base has a volume of 130 in3 (2.13 dm3) and the sight tube reads 0-10%. 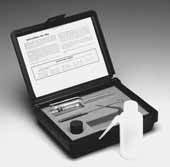 The Roll-a-Meter can be used as a pycnometer to determine the specific gravity of cement, sand or gravel as well as the percent free-water in damp sand and gravel. 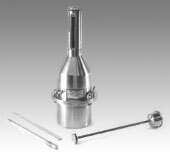 The Roll-a-Meter is available in bronze or aluminum and is supplied in a wood case with straight edge, tamping rod, syringe, baffle-bottom funnel and instructions.